This simple, quick, and easy gluten-free onion dip recipe is a great way to ensure that you will have something safe to eat at pot luck parties, office events, etc. The only catch is – make sure to throw it together the night before. It really needs to sit overnight so the onion flavor can permeate. Remember those extra onions we sauteed? 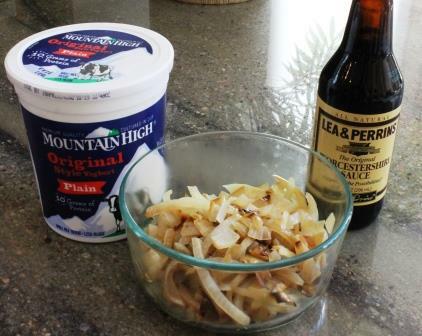 Grab those, your favorite plain yogurt, and your Lea & Perrins Worcestershire Sauce. That is a gluten-free staple in my house! There’s really no “recipe”here – the quantities all depend upon your personal taste. Want it with more bite? Use more Lea & Perrins. Want it more oniony? You know what I’m getting at. Mix it in a nice container, let it sit overnight, stir, and boom – you’ve got a great tasting, healthy, and gluten-free onion dip. Serve with your favorite gluten-free dipping chips. Have you seen the price of avocados lately? Ey carumba! But you’ve been invited to a party and you need to bring something gluten-free. You wanted to bring guacamole, but…. the sticker shock is just too much for more than a few servings. Well, don’t worry: here’s a way to stretch your guacamole, whether at home or as a party dish. Use your favorite gluten-free guacamole recipe, or try mine. If you can, make it the night before your event so that the ingredients have time for their flavors to mingle. 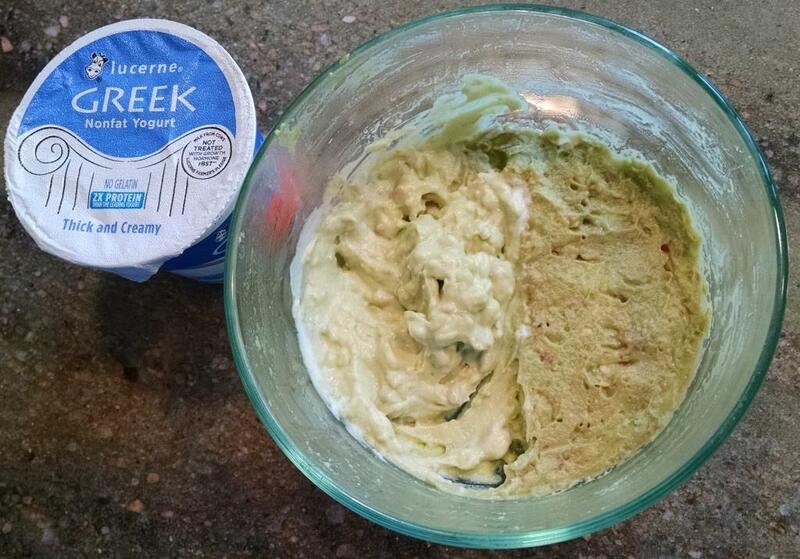 Right before the party or event or meal, mix in an equal amount of plain Greek yogurt. 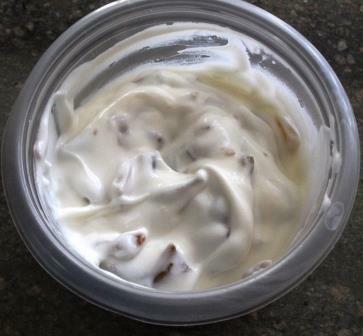 Of course you can also use sour cream, but the yogurt is healthier and higher in protein. Money-saving tip: check the “quick sale” or clearance area of your dairy section. Sometimes you will find items marked down 50% because they are approaching their expiration date. The yogurt cup pictured here was 44 cents – vs. $1.39 for the sale price sour cream. If I’m eating this at home, I only mix together as much as I plan on eating and keep the guacamole protected from the air the rest of the time so it doesn’t brown. 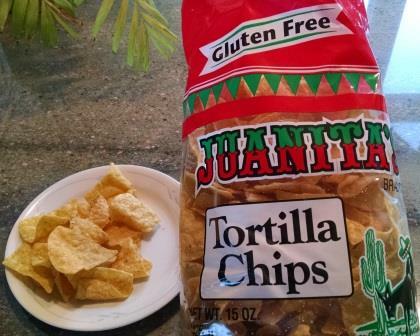 Mix well, then serve with your favorite gluten-free tortilla chips (Juanita’s is my absolute favorite brand!). Step One – bake the cornbread. At the holidays, it’s always a bummer when gluten-free folks can’t have stuffing. I’m a big fan of stuffing, so I decided to give it a shot. Of course, you can add whatever you’d like to stuffing – giblets, nuts (I usually add pecans), chopped apple, etc., but since I’m kind of broke right now, I used what I already had in the house, which wasn’t much. I wanted to see how it tasted without herbs and spices, and I only put the parmesan on 1/2 of the dish for the same purpose. This recipe would make a good base for more complex stuffing recipes (or dressings, as some people call them). The Hodgson Mill brand of cornbread was not as dense as the Bob’s Red Mill brand, so this stuffing ending up being very light and fluffy, which I’m not used to. I made the mistake (I know, can you believe it?!) of putting some cranberries in the stuffing. They were just too bitter and overpowering for the light flavor. I won’t do that next time. Go ahead, experiment and enjoy! Preheat oven to 350 degrees. Combine first five ingredients in 9×9 glass baking dish (I’m sure metal is fine, I used Pyrex). Mix well, with hands. Do not flatten or compact. Pour chicken broth just until you can see it come to the top of the mixture. Sprinkle a thin layer of the cheese over the top. Bake for 20 minutes at 350. Turn oven up to 400. Bake an additional 10 minutes or until cheese is browning on top. The rice and cornbread should have absorbed almost all the chicken broth, making them moist and fluffy. This is hot, hearty comfort food that can be tweaked to your preferred level of moistness. Leftovers can easily be reheated in a bowl – fill bowl with the amount you want, then pour a little leftover chicken broth in. Microwave for about 2 minutes on 70%, stir, then an addition 30 – 60 seconds on high for one bowl. It should absorb the additional chicken broth as it sits. I have a love/hate relationship with eggs. I hate the smell. I love the protein. I won’t eat them if they’re runny. I love that they’re versatile and easy to prepare. I also do not like ranch dressing. Yes, I know, there is actually one human being alive who doesn’t like ranch. Whatev. But I do like the small company Litehouse, and I do like their OPA dressings which are super low in calories and high in protein. And, two negatives make a positive, right? Break eggs into a small, non-stick skillet. Add cream and dressing. Stir with plastic fork or whisk until thoroughly mixed. Cook on your preferred setting until your level of doneness is achieved. Meanwhile, toast bread. 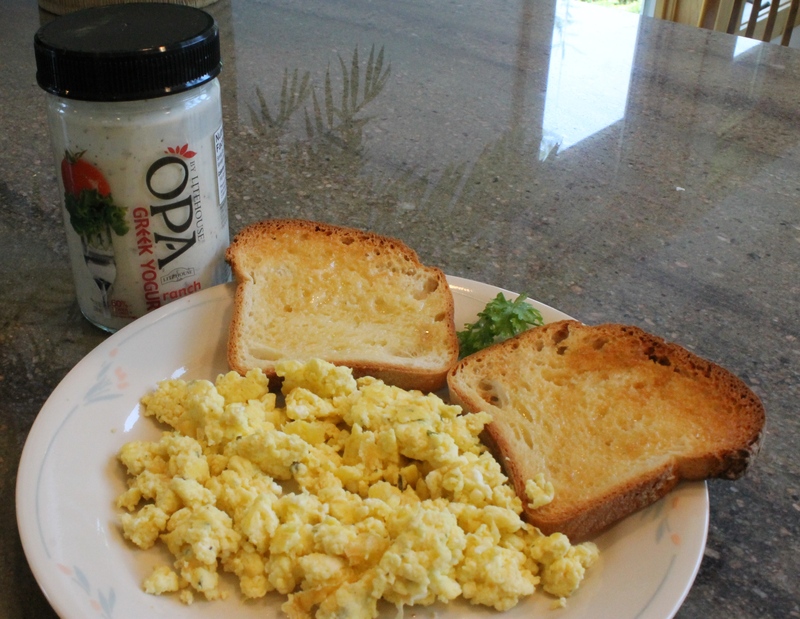 Click here for more on Litehouse OPA Ranch dressing. I love it when something good happens by accident. But when something great happens by chance, well then – I’m going to tell everyone. I was in Wal-Mart and saw Bistro Sensations Smoked Mozzarella with Artichoke and Garlic fully cooked chicken sausage in the refrigerated section. I have no idea why I picked up the package. When I turned it over, surely enough, it said gluten-free. That was all I needed to see! I was also pleased that they contained no soy (although they are not labeled as soy-free). When we got home, we put those sausages on the grill. On a scale of 1 to 10 (10 being the best): I give them an 11. Even my gluten-mongering spouse loved them. Great flavor, great texture…I felt like a normal person eating normal food. That doesn’t happen too often. The sausages were not greasy. The seasonings were just right. We had 1-1/2 sausages each with some beans. That left one sausage. I decided to make a crustless quiche with it the next night. There are no seasonings other than salt in the following recipe because I wanted the flavor from the sausage to be the feature of the dish. Chop up cauliflower and sausage. Spread half of each on the bottom of the pan. Add milk/cream and salt. Beat some more. Pour 3/4s of the egg mixture into the pie pan. Scatter the other half of the cauliflower and sausage evenly through out the pan. Pour the rest of the egg mixture into the pan, covering the rest of the ingredients. Let sit for about 5 minutes to set, then cut and enjoy. Makes 4 generous slices as a main course. This article originally appeared on Celiac-Disease.com on April 17, 2010 at http://celiac-disease.com/real-food-real-taste-and-gluten-free-bistro-sensations/ Unfortunately, it is not clear if Bistro Sensations sausages are still available. I’m sure other brands will work just as well. Not very “yellow” but that’s okay. Well, this was interesting. 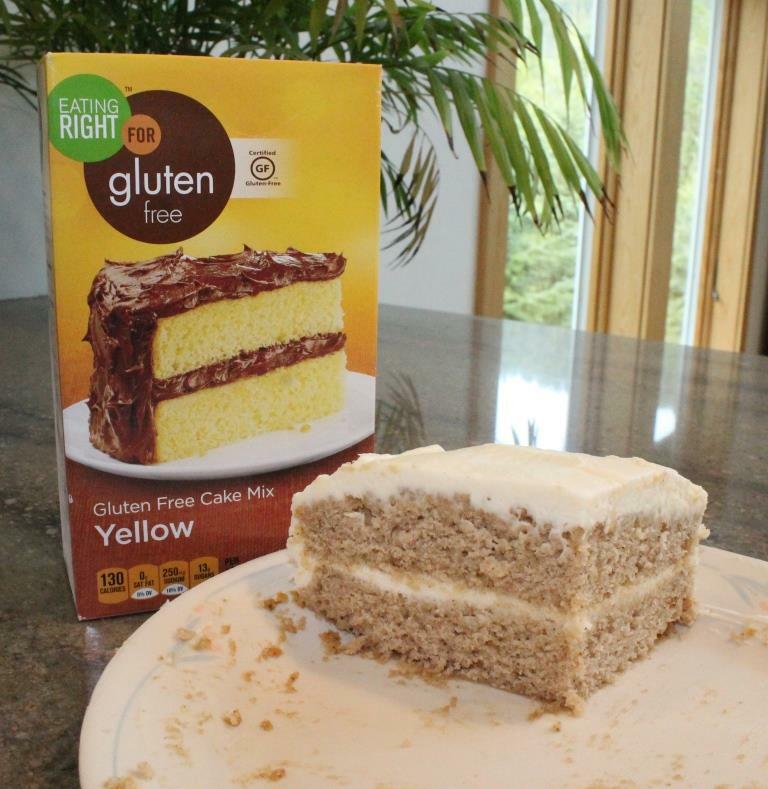 I wanted to make a gluten-free spice cake, but Safeway didn’t have any mixes in that flavor. Their new “healthy” EATING RIGHT label offered only yellow cake mix, so around $3.00 per box, I decided to get that and check online to see what spices to add. So, I followed the instructions, added the spices, and commenced to mixing. I went with cloves instead of allspice since the birthday boy has an aversion to the latter. Then, my epiphany: wait a minute, why does it say to “grease or spray a 9×9 cake pan”? Shouldn’t it say PANS – like as in plural? HA HA not. Even though the picture on the front and back of the box show a two-layer cake, the contents of the box are indeed for only one layer. Oops. That’s probably why it was so inexpensive. Doy. The birthday recipient always expected a two layer cake: more frosting, you know? (By the way, I always use the Martha Stewart recipe for cream cheese frosting. It works out well.) So, I made two fairly shallow round cakes and baked them for a shorter time. The day of baking, the cake was surprisingly moist and the consistency was excellent for gluten-free. The spices worked out perfectly, even though they were for TWO cake layers, not just one. But, as the days went by, the flavor faded. It was very strange. Recommended? Sure. But betware – you will need TWO boxes to make a two layer cake.